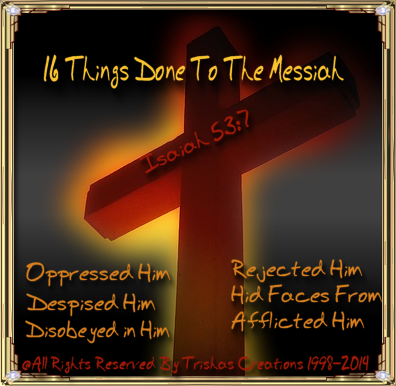 "16 Things Done To The Messiah"
Welcome to "16 Things Done To The Messiah"
Through many hardships--- Those who commit themselves to Christ's Lordship and who will finally enter the Kingdom of Christ must suffer, many hardships along the way. Living in a Hostile World, they must engage in spiritual warfare against sin and satans power. Suffering For Jesus is something anyone should be glad to do. As Jesus suffered way much more than we can imagine. Suffering in bad health, or something else in our lives, is really minor compared to what "Jesus DID for You and Me!" I have listed "16 More Things Done to The Messiah (Jesus)" so I am in hopes once again that they will help you see just what all He went through compared to what we go through here on earth.